The aims of the study and general contents of the thesis are introduced. These are to provide insight in the history of augmentation mammaplasty (chapter 2); a survey on the life span of silicone gel-filled mammary prostheses (chapter 3); a comparison of implant age and integrity with the extent of migration of silicone through the fibrous capsule surrounding a mammary prosthesis (chapter 4); the imaging signs and radiologists' jargon of ruptured breast implants (chapter 5); the accuracy of mammography, ultrasonography and magnetic resonance imaging in detecting implant leakage (chapters 6 and 7); and the locoregional and systemic pathological responses reported so far (chapter 8). Possible consequences of all data presented and possible subjects of further study are discussed in chapter 9.
brought about the United State's Food and Drug Administration, in 1992, put a virtual ban on all silicone gel-filled implants. Silicone implants became the center of controversial debate and anxiety, and a century of careful research that had cumulated in the development of a near ideal mammary implant came abruptly to its end in the United States. This resulted in a demand for alternative methods of augmenta­tion mammaplasty and new fillers are currently being developed. As the European population has not experienced the epidemic of fear brought about in the United States the development of silicone mammary prostheses can continue, albeit less vigorous. Silicone gel-filled prostheses with their superior elasticity and non-palpability, are still being further improved. The discussion on possible side effects of implanted silicone has resulted in a growing number of patients inquiring whether or not their prostheses are intact and when failure of the prostheses is to be suspected. Between November 1988 and May 1995, 182 patients had their silicone mammary prostheses replaced, repositioned, or removed one to three times. Capsular contraction, dislocation, pain, paresthesia, and/or suspected rupture were common indications for surgery. To try and be able to provide an indication as to the correlation of implant age and integrity, we recorded the status of all 426 prostheses observed during secondary surgery. 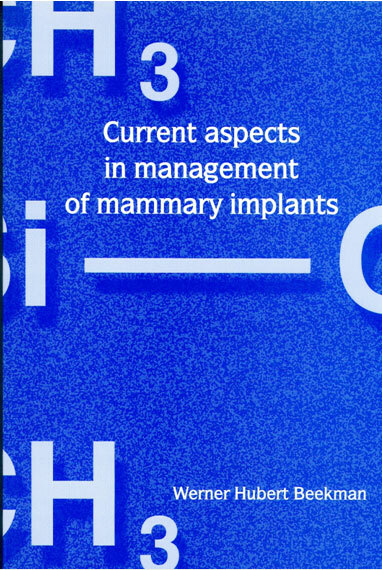 In this selected group of patients, approxi­mately 50 percent of the mammary prostheses with an implant age of 7 to 10 years showed gel bleed or rupture. Applying the survival Kaplan-Meier curve, 50 percent of implants may be expected to bleed or be ruptured at the age of 15 years. Rupture was observed more frequently than gel bleed. It seems that there is no chronologic relation between gel bleed and rupture. The usual reaction of the human body to implantation of a silicone prosthesis is formation of a fibrous capsule. Local reactions to silicone outside this fibrous capsule and distant migration of silicone particles have been described. Sofar, transcapsular migration of silicone particles from the mammary implant through the fibrous capsule of mammary prostheses has not been studied. In this prospective study 71 capsules found in 40 patients were histologically studied. The Chi-square test was applied to evaluate possible correlation between silicone migration on the one hand and implant age and integrity of the prostheses, on the other. The degree of silicone migration was discerned in four stages. Stage 1 represents no silicone particles in the capsule, stage 2 represents migration up to less than half of capsule thickness, stage 3 shows migration confined to the outer half of capsule thickness and stage 4 means transcapsular silicone migration. In only 4 out of the 71 capsules no migration into or through the capsule was observed. The degree of silicone migration was significantly less in cases where the capsule was calcificated and was significantly more in cases where implantation exceeded 12 years. There was no significant correlation between status of the prosthesis (intact, bleeding or rupture) and degree of silicone migration. Silicone gel leakage problems are central to the furor over the compli­cations alleged to be caused by breast implants. As clinical examination may not reveal confirmatory signs of gel-bleed or rupture, radiologists are often requested by plastic surgeons to evaluate the integrity of the implant's envelope. The findings of the various imaging investigations are reported on in terms such as "teardrop", "linguini", and "snowstorm". In order to interpret the radiologist's report correctly, the plastic surgeon should be familiar with these terms and the findings they represent. In this paper we present an explanation of the radiolo­gists' vocabulary in these matters, as well as an indication as to the significance of the various signs. be detected by means of clinical examination or combined MG and US. No statistical significant relationship exists between silicone leakage and capsule contraction was found. In a prospective setting, we studied the accuracy of MRI and ultrasono­graphy (US) for preoperative detection of rupture in 35 single-lumen silicone gel-filled implants in 18 patients. The positive predictive value for implant rupture of US is 0.70. The negative predictive value 0.64. Sensitivity and specificity for implant rupture are 0.44 and 0.87, respec­tively. Accuracy, defined as the total of true-positives and true-negatives devided by the total number of implants studied, is 0.66. The positive predictive value of MRI is 1.00 and the negative predictive value 0.90. Sensitivity and specificity of MRI are 0.88 and 1.00, respec­tively, and the accuracy is 0.94. MRI offers a significantly higher degree of diagnostic sensitivity (p= 0.02) and accuracy (p= 0.004), and should be regarded the 'gold standard' in evaluation of rupture of silicone gel-filled breast implants. When MRI is not readily available, US should be considered an acceptable alternative. metaplasia has been reported only once and was thought to have devel­oped as a reaction of ductal cells to chronic irritation. Whenever silicone particles have reached the locoregional lymphe nodes, they seem to be phagocytozed by multinucleated giant cells. Histiocytic necrotizing lymphadenitis (Kikuchi disease) was described once, and was alleged to be the result of a sudden challenge of the macrophage system posed by large amounts of silicones. The proximity of a B-cell Non Hodgkin lymphoma to a silicone induced granulomatous reaction was noted in a case report. In these anecdotical reports, no conclusions can be drawn as to a relational aspects of free silicone molecules and these local effects. So far, there is insufficient evidence for systemic effects of silicone leakage such as autoimmune and connective tissue diseases and there appears to be no increased risk of breast cancer in patients with silicone implants. technique has its limitations. Three-dimensional images of implants may be found superior in the evaluation of the condition of breast implants. Meanwhile, patients with prostheses of an implant age over 12 years should be careful examined and, if so indicated, should undergo ultra­sonographic or magnetic resonance imaging of the implants. When in doubt, explantation should be considered in all presenting cases with implants of 15 years or older. Whether the improved quality of newer generation prostheses will result in an extension of the current 15-year critical margin, again, still needs to be studied. In patients seeking (repeated) implantation, the choice for a certain type of prosthesis should be made by patient and physician together. Mammaplastic surgeons should keep open minds while looking for the answers to all of the yet unanswered questions. In hoofdstuk 1 worden de doelen van het in dit proefschrift gepresen­teerde onderzoek uiteengezet. Het proefschrift bevat een overzicht van de geschiedenis van de mamma augmentatie (hoofdstuk 2), de resul­taten van een onderzoek naar de levensduur van siliconen borstpro-thesen (hoofdstuk 3) en een vergelijking van de integriteit en leeftijd van prothesen met de mate van migratie van siliconen door het fibreuse kapsel dat de prothese omgeeft (hoofdstuk 4). De terminologie die door radiologen wordt gebruikt bij het beschrijven van de mammografie-, echografie- en MRI-beelden wordt gepresenteerd in hoofdstuk 5. De betrouwbaarheid van mammografie, echografie en MRI bij de beoorde­ling van de integriteit van siliconen prothesen wordt beschreven in de hoofdstukken 6 en 7. In hoofdstuk 8 wordt een literatuuroverzicht gepresenteerd van de locoregionale en systemische pathologische processen welke mogelijk het gevolg van lekkage van siliconenmate­riaal zouden kunnen zijn. De uit deze studies voort-komende overwe­gingen en aanbevelingen worden besproken in hoofdstuk 9. In 1895 deed Czerny uit Heidelberg de eerste poging om een borst te vergroten door transplantatie van autoloog vetweefsel. Sindsdien zijn er verschillende methoden ontwikkeld om een onderontwikkelde borst te vergroten. Een veelheid van materialen werd gepropageerd, maar om verscheidene redenen weer verlaten. De toepassing van siliconenmateriaal sinds 1962, vormde een belangrijke verbetering van cosmetiek en verminderde de complicaties zoals kapselvorming en extrusie van het gebruikte materiaal. De elastische eigenschappen van een met siliconengel gevulde prothese met een siliconenelastomeer als omhulsel, zijn tot nog toe onnavolgbaar. Ondanks de vele verbete­ringen welke de oorspronkelijke prothese ten deel viel, werd het gebruik van de siliconenprothese voor cosmetische doeleinden in de Verenigde Staten van Amerika door de Food and Drug Administration (FDA) in 1992 nagenoeg verboden. Deze prothesen werden het middel­punt van controversie en een eeuw van wereldwijd, uitgebreid en zorgvuldig onderzoek dat leek te leiden tot een (bijna) perfecte borst-prothese kwam ten einde in de Verenigde Staten. Desondanks worden deze prothesen, zij het op kleinere schaal, verder ontwikkeld. Daarnaast werden en worden prothesen ontwikkeld met alternatieve vullingen en omhulsels. De laatste jaren is er een discussie gaande betreffende de mogelijke bijwerkingen van het gebruikte siliconenmateriaal bij mamma augmentatie. In toenemende mate melden zich vrouwen op de polikliniek met de vraag of de geïmplanteerde prothesen intact zijn en wanneer verwacht kan worden dat ze kapot gaan. Tussen november 1988 tot mei 1995 werden bij 182 patiënten de siliconenprothesen vervangen, gerepositioneerd of verwijderd. De indicaties voor deze operaties waren kapselvorming, dislocatie, pijn, paraesthesieën of verdenking op ruptuur. Peroperatief werd de integriteit van de prothesen genoteerd. In deze geselecteerde groep patiënten bleek dat tussen 7 en 10 jaar na implantatie, ongeveer 50% van de prothesen defect zijn. De Kaplan-Meier overlevingscurve laat echter zien dat 50% van de prothesen niet meer intact zal zijn na een implantatieduur van 15 jaar. Ruptuur werd meer gezien dan gelbleed, maar een chronologische relatie tussen beide kon niet worden aangetoond. Hoofdstuk 4: Migratie van siliconenmateriaal door het bind-weefsel kapsel rond de prothese. Kapselvorming is een reactie die optreedt na implantatie van lichaams­vreemd materiaal zoals een siliconenprothese. Locoregionale reacties op vrijkomend siliconenmateriaal buiten het kapsel zijn beschreven, maar er zijn geen studies aangaande de transcapsulaire migratie van siliconen partikeltjes bekend. In een prospectief onderzoek werden 71 kapsels, gevonden bij 40 geopereerde patiënten, histologisch onder­zocht. Bij 4 van de onderzochte kapsels werd geen siliconenmigratie vastgesteld. De diepte van siliconenmigratie in de overige kapsels werd gescoord in 4 gradaties. Graad 1 betekent geen siliconen migratie. Graad 2 betekent migratie tot de helft van de dikte van het kapsel, terwijl de migratie in graad 3 zich uitbreidt tot in de buitenste helft van het kapsel. Bij graad 4 is de migratie transcapsulair. De correlatie tussen migratie van het siliconenmateriaal enerzijds en de integriteit van de prothesen en implantatieduur anderzijds werd geanalyseerd door middel van een Chi-square test. De migratie was significant minder bij calcificatie van het kapsel en was significant meer bij een implantatie­duur langer dan 12 jaar. Er bestaat geen significante correlatie tussen de integriteit van de prothesen en de mate van migratie van siliconenmate­riaal. Hoofdstuk 5: Beelden en radiologisch jargon bij desintegratie van borstprothesen. De desintegratie van borstprothesen kan onvoldoende, en soms zelfs niet, worden vastgesteld door lichamelijk onderzoek. Aanvullend röntgenologisch onderzoek kan meer duidelijkheid verschaffen. Bij de beoordeling door de radioloog, van de beelden van verschillende technieken, worden Angelsaksische termen als "teardrop", "linguini" en "snowstorm" gebruikt. Om deze termen correct te interpreteren dient de behandelende arts op de hoogte te zijn van de betekenis ervan. De termi­nologie wordt verklaard en de daarbij behorende significantie besproken. Hoofdstuk 6: Gelbleed en ruptuur van siliconen borst­prothesen: klinische diagnose en voorspellende waarde van mammografie en echografie. geen statistisch significante relatie gevonden tussen siliconenlekkage en kapselcontractie. In een prospectief onderzoek werden 18 patiënten met 35 siliconen borstprothesen preoperatief onderzocht met echografie en MRI. De bevindingen hiervan werden vergeleken met de peroperatief gevonden status van de prothesen. De positief voorspellende waarde van echografie voor ruptuur van de prothese was 0,70. De negatief voorspellende waarde was 0,64. De sensitiviteit en specificiteit van echografie voor ruptuur waren respectievelijk 0,44 en 0,87. De accuraat­heid ('accuracy') van de echografie, gedefinieerd als het totaal ware positieven en ware negatieven gedeeld door het aantal prothesen, bedroeg 0,66. De positief voorspellende waarde van MRI was 1,00 en de negatief voorspellende waarde, 0,90. De sensitiviteit en specificiteit van MRI waren respectievelijk 0,88 en 1,00. De accuraatheid bedroeg 0,94. MRI onderzoek levert een aanzienlijk hogere sensitiviteit (p=0,02) en accuraatheid (p=0,004) en moet beschouwd worden als de gouden standaard voor de in vivo beoordeling van borstprothesen. Dit hoofdstuk is een overzicht van de literatuur aangaande de locoregionale effecten van extracapsulaire siliconenlekkage. Deze extracapsulaire ruptuur van de prothese leidt met name tot de vorming van granulomen ('siliconomen'). Synoviale metaplasie wordt gezien bij prothesen met een ruw oppervlak. Plaveiselcelmetaplasie werd éénmaal beschreven, maar een duidelijke relatie met siliconenlekkage kon in de betreffende casus niet worden aangetoond. Ook Kikuchi disease of histiocytaire necrotiserende lymfadenitis en de nabijheid van een B-cel non-Hodgkin lymfoom naast een, door grote hoeveelheden siliconen geïnduceerde, granulomateuze reactie werden éénmalig beschreven in de literatuur. Uiteraard kunnen geen conclusies worden getrokken uit deze enkelvoudige bevindingen. Tot nog toe is er onvol­doende bewijs voor het optreden van systemische effecten zoals auto-immuunziekten en bindweefselziekten als gevolg van van siliconen lekkage. Er lijkt geen verband te bestaan tussen het risico van mammacarcinoom en de aanwezigheid van siliconen prothesen. Na bijna een eeuw van evolutie van borstvergrotende technieken sprak de Food and Drug Administration (FDA) in de Verenigde Staten van Amerika een vloek uit over de siliconengel gevulde borstimplantaten. De veiligheid van deze prothesen op lange termijn, dient bewezen te worden. Alhoewel een toenemend aantal vrouwen haar borstprothesen laat verwijderen blijft de controversie, of zij hierbij baat hebben of niet, bestaan. De vraag of systemische effecten zoals auto-immuunziekten en bindweefselziekten kunnen worden veroorzaakt door siliconen lekkage kan alleen door langlopend epidemiologisch onderzoek met grote populaties worden beantwoord. De oorzaak van kapselcontractie rond de prothese dient ook alsnog ontdekt te worden. Alhoewel magnetic resonance imaging (MRI) momenteel de gouden standaard voor het onderzoek naar de integriteit van borstimplantaten vormt, heeft ook deze techniek beperkingen. Er dient te worden onderzocht, of driedimensionale afbeeldingtechnieken beter voor dit doel geschikt zijn. Zolang dit alles niet bekend is, dienen patiënten met prothesen die 12 jaar of langer geleden werden geïmplanteerd, zorgvuldig onderzocht te worden. Indien de integriteit van de prothesen niet kan worden vastge­steld door lichamelijk onderzoek, dient aanvullend echografisch of MRI onderzoek te worden verricht. Bij twijfel aangaande de integriteit dient verwijdering of vervanging van prothesen te worden overwogen bij patiënten die zich 15 of meerjaren na implantatie presenteren. Of een toegenomen kwaliteit van de huidige prothesen zal leiden tot verlegging van deze 15-jaars grens, dient óók nog onderzocht te worden. Indien een patiënt alsnog een implantatie van borstprothesen wenst te ondergaan, dient de keuze van implantaat door patiënt en arts samen te worden gemaakt. Totdat duidelijkheid door aanvullend weten­schappelijk onderzoek wordt verkregen, dienen mammaplastische chirurgen mee te zoeken naar een oplossing voor de gestelde problemen en open te staan voor veranderingen, die een aanpassing van de te maken keuze kan beïnvloeden.